Anyone who works in the financial industries knows the importance of keeping good statistics. 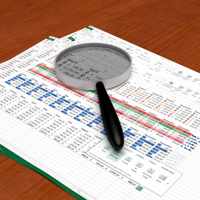 More likely than not, you are using a spreadsheet program on an everyday basis – most commonly, Microsoft Excel. Microsoft Excel 2013 has a great feature for importing financial data that and stats that you find online into your own spreadsheet and tracking data from Excel itself. This comes in very handy for anyone who works with stocks, currencies or any other type of constantly fluctuating data. With this Excel feature, you are able to not only import data you find online, but also set it up to automatically refresh these statistics within your spreadsheet whenever they change. Here’s a step-by-step how-to guide at how to do this if you have the latest version of the Microsoft Office suite and are using Microsoft Excel 2013. Enter the URL from which you want your data to be taken in the line on top of the window that says “Address” and then click Go.